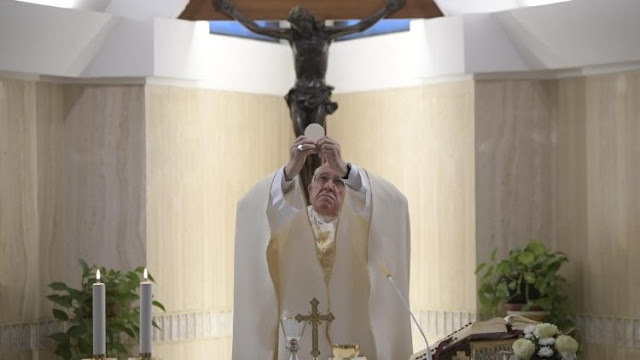 In his homily at Mass in the Casa Santa Marta on Tuesday, Pope Francis says God takes the first step towards us and loves us because He is compassionate and merciful, despite our indifference. Pope Francis offered Tuesday’s Mass for the eternal rest of Archbishop Giorgio Zur, who died late Monday night. He lived in the Casa Santa Marta with the Pope and once served as Apostolic Nuncio to Austria. In his homily, Pope Francis reflected on the day’s Gospel (Mk 6:34-44) about the multiplication of the loaves and fishes, and on the First Reading, taken from the First Letter of John (4:7-10). The Holy Father said the Apostle John explains “how God manifests His love in us.” “Let us love one another, because love is of God,” John writes. Reflecting on the multiplication of the loaves and fishes, Pope Francis said Jesus fed the crowd out of compassion. Pope Francis said God’s love always comes first and is compassionate and merciful. He said it is true that the opposite of love is hate, but that many people are not aware of “a conscious hate”.